Yes, you have the modem from the factory as an option, and you essentially paid for it when you bought the truck. I think 2 years of service is included. Best I can tell the modem that you have that makes this possible cannot be added after the fact. Smart link is a module making it possible to add this feature to a vehicle that didn't come with it. I have 4 trucks setup in it. What I can't seem to get a answer about is what's the cost after the free two years is up... I'd like to know. I believe it's $17/month, and that is how the cost if the SL module was derived. 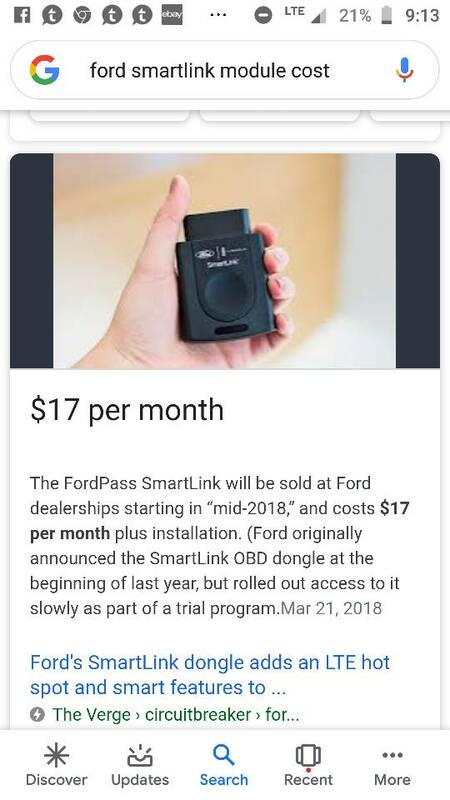 $17/mo for 24 months plus installation. Who knows what that cost will be 2 years from now though, or if it will even still be offered. This almost seems to suggest that it will be free after that? Last edited by mwemaxxowner; 04-15-2019 at 07:16 PM. I know what you meant, but it's the same thing, more or less. One is paid for when you buy the truck, one is paid for after the fact. But aside from that, same two year period, same cost, yours was just included as part of your package, so I believe the monthly rates are the same. Last edited by mwemaxxowner; 04-15-2019 at 08:11 PM. Looks simular , I believe mine was called sync connect on the window sticker. 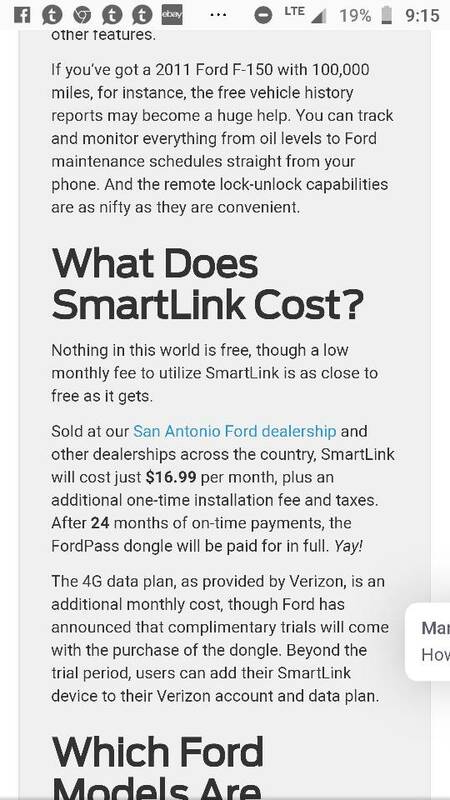 According to Forbes (not Ford)....". Where Ford’s approach is different from other automakers is keeping*SYNC Connect services free of charge, at least for the first five years."